The artist John Russell created the pastel portrait of Sarah Garrow in 1785 or 1786. It appears to have been the first in a series of his portraits of members of the Garrow family. By this time Sarah had raised her large family, watching her two elder sons become merchants in India where they were becoming wealthy, and her youngest son starting his career as a barrister. Her youngest daughter had made a good marriage. And her eldest daughter had stayed home and helped with the raising of the large family. Sarah, with her husband as the headmaster of his own school for young gentlemen, raised her family in their school and home, “The Priory”. The building was an ancient structure, thought to be in earlier times connected to Walden Abbey. It was situated on a nine acre plot on Dury Road near St. Mary the Virgin Church at Monken Hadley, just north of London. At the time of John Russell’s portrait of Sarah, she had celebrated the birth of 7 grandchildren, including the two children by her son, William with Sarah Dore. 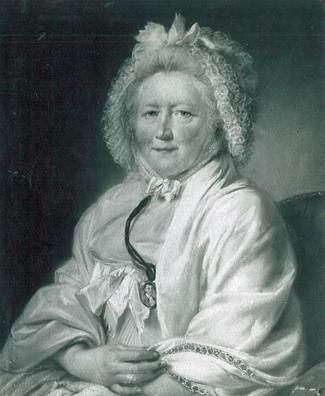 After her 40 years of marriage, Sarah died on 9 January 1789. She lived to see her son, William, work for five years as a barrister in the Old Bailey, and achieve much of the notoriety for which he is celebrated today. Many congratulations to Richard Braby whose tireless efforts have traced this image of my g.g.g.g.grandmother. Hello, Sarah was also my 4th Gt Grandmother.Through Jane marrying William Monk. My Great Grandfather William Monk .married ellen Keell.It was his second wife Ada Fanny Roberts my great grandmother .They married 1876 >My grandmother Ada Elizabeth Monk was born 1877. I am trying to find out more about Ellen and when she died. Plus William H G Monk is not their son ,he is the son of William,s brother Francis T Monk. It is good to see that Sarah Hill is getting a higher profile, as in the TV series.